Above is a photo of a new "sky island" species of Vaejovis. 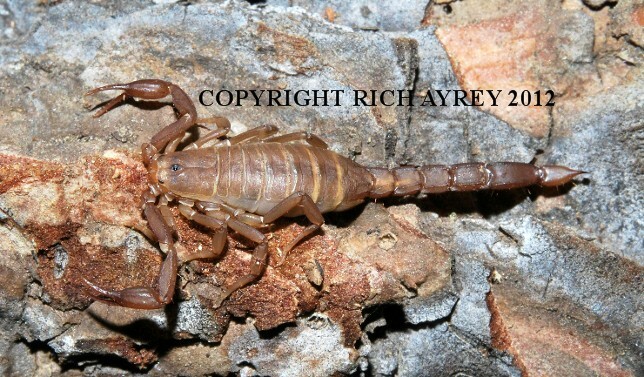 This Arizona Scorpion pic was taken along the Mogollon Rim in northern Arizona. Vaejovis trinityae is related to Vaejovis crumpi Ayrey & Soleglad, 2011 and Vaejovis lapidicola Stahnke, 1940. This is a distinct new species, named in honor of Trinity Frances Ayrey. Download the description here. I am very fortunate to have pics of rare scorpions like this one. Arizona Scorpion World page created 09/15/13. Arizona Scorpion World page last updated 09/08/14.